Jane Goodall's conservation MasterClass is coming this fall, to a computer near you. Think about it. How often can you learn from the experts? If you are lucky, you are in the right place at the right time and can get to hear a person speak at a conference or festival. I had that opportunity, ironically the day after Dr. Goodall's 73rd birthday on April 4, 2008. My school at the time, Eagle Cove School, was hosting a "Roots & Shoots" Fair and we were fortunate enough to have her as a guest speaker. She started her talk as she often does, hooting like a chimpanzee. Memorable! This fall, she's working in coordination with MasterClass.com to present 25 online lessons via video on animal insights, conservation, and activism. A downloadable class workbook and "office hours" are available. What an amazing opportunity to learn from a legend! 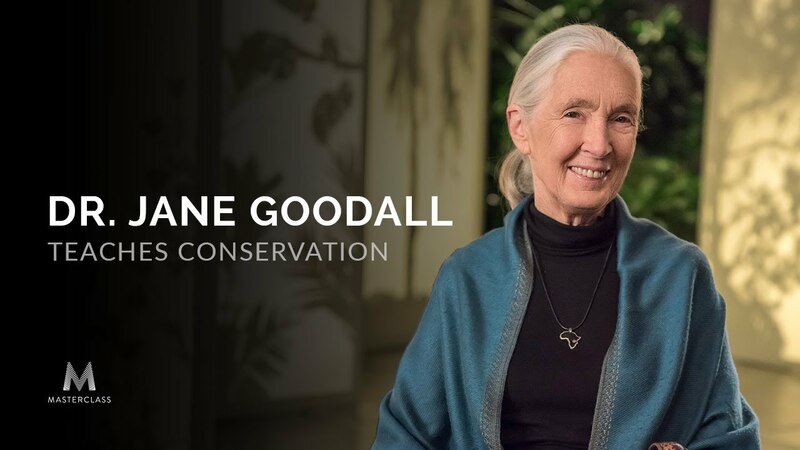 To get a sneak preview of your class from your instructor, watch this video below or go check out MasterClass.com's page "Dr. Jane Goodall Teaches Conservation" page. It might even inspire you to sign up! Maybe this year, on your holiday or birthday wishlists, if you are someone who has everything, maybe you'll get your friends or families to give you the gift of learning. That's definitely one way to make a little less environmental footprint in "stuff," but may be a great way to grow your knowledge and environmental impact! MasterClass.com has a wealth of other learning opportunities from experts, so maybe that wishlist of yours might grow quite long!